These yummy peanut butter rice krispie treats have a surprise flavor of banana in them! When my husband first mentioned this treat I thought he was kidding even though it sounded good. 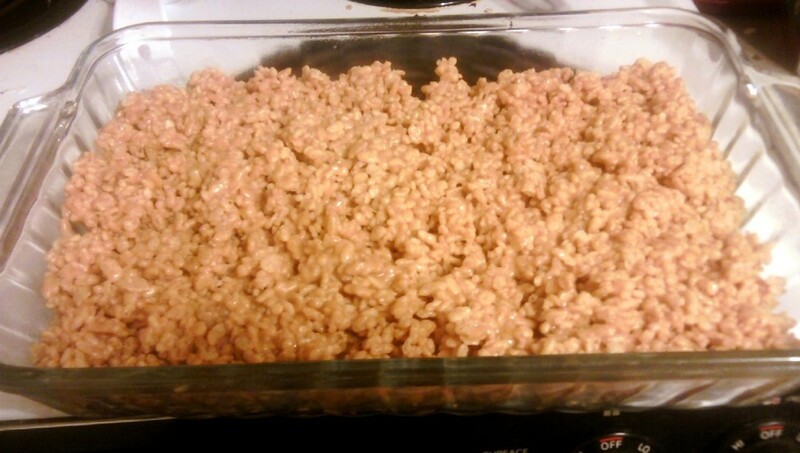 I just couldn’t fathom how to make peanut butter/banana rice krispie treats. Peanut butter, yes. But mashing bananas into it? Gross. He got me curious, though, so I Googled. Found zilcho. I was able to find peanut butter treats and I even found banana nut treats. But not peanut butter/banana. I also reached out to my more than 800 Facebook buddies and got no solid recipes. Intrigued or grossed out a lot of folks, but no recipes. So, we experimented. I made the recipe for the banana nut treats (without the nut flavoring) and added peanut butter. They tasted good but were a weird dark color and were hard as a rock and crunchy. No good. This last weekend, I reversed the thought process by making the peanut butter recipe and adding the banana this time. Voila! They were very sweet, but yummilicious. And just what my husband remembered from when he was a kid. It seemed that the key was using a sugar/corn syrup mix instead of marshmallows. I’ve decided to call these Elvis Rice Krispie Treats because of Elvis’ love for fried peanut butter/banana sandwiches. Actually, as disgusting as it sounds, the combo is delectable. I think these treats are great for after school treats, potlucks, or just a weekend treat. Want your own Elvis Rice Krispy Treats (Peanut Butter/Banana)? So, after all that long discussion, here is the recipe. Melt the sugar and corn syrup together, stirring just about constantly. Bring the sugar/corn syrup mix to a boil then remove from heat. Mix in the peanut butter until it’s all gooey and one mix. Mix in the dry banana pudding mix until well blended. Slowly add the rice cereal. I personally think it’s easier to mix in half then add the other half. Spread the mix into the dish and let it set. Cut into squares if you have the patience, or just tear into with your hands.